I first encountered Star Trek at a library. They displayed the 25th anniversary VHS set on a shelf under a window, placing it at eye-level for two budding sci-fi fans desperate for something to watch other than Star Wars (which I love, but once you can recite every line of dialogue in A New Hope from memory it’s time to broaden your sci-fi horizons). When all the videos were checked-in, they formed a picture of the most beautiful spaceship we’d ever seen. 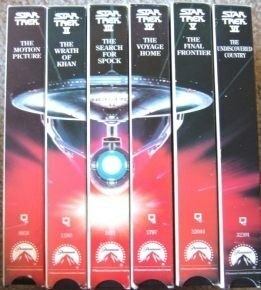 Star Trek aired 23 years before I was born and yet I was obsessed before seeing a single episode. My mother’s only experience with Star Trek was seeing Wrath of Khan in theaters, which convinced her it wasn’t child-appropriate. So my sister and I followed the course of action that worked when we wanted to watch Star Wars. We talked to Daddy. He remembered watching Star Trek with his dad, so we got the go-ahead to bring home one of those marvelous videos. Star Trek’s 50th birthday is this week on September 8. It’s a great time to be a Trekkie. We got a fantastic feature film (I liked the first two movies set in the Kelvin timeline well enough, but Beyond was the best. It felt like “real Trek,” just as Simon Pegg promised). A new series is coming next year after 11 years without Star Trek on TV and there was a new episode of Star Trek Continues released this past weekend (this fan-made series is fantastic — it’s like getting a season 4 for the Original Series!). My sister and I are watching “Embracing the Winds” together this afternoon, ready to be those two little girls awed by the U.S.S. Enterprise and giddy about the prospect of quality sci-fi once again.